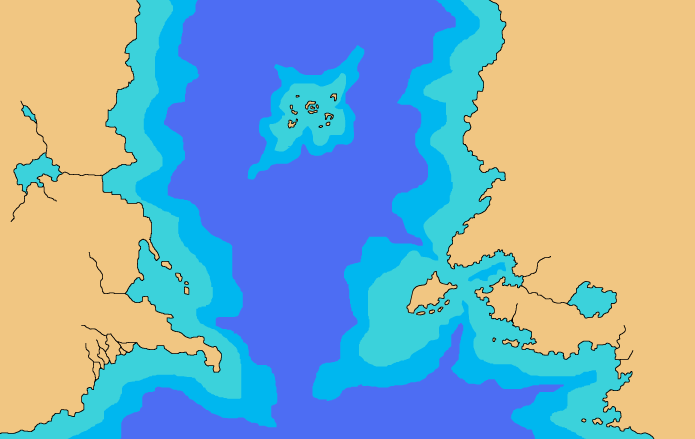 I ‘m starting to put together a map of the entire world of Peyllen, and how the Sea of Tears (from the “Witch’s Trilogy”) fits into the greater world. You can see the Sea of Tears in the middle with land on either side. Oddly the islands in the Sea of Tears do not appear on any maps of the various kingdoms because any ship who traveled there never returned. They assume there’s a sea monster, or some large whirlpool there. I love having maps in Gimp because I can do various layers that include roads, trade routes, and even a map just to lay out which character goes where in the world. Then you can just make the layers that you want visible. It’s fantastic for story planning, and keeping everything in order. Plus it’s just awesome to look at. Next I’ll be adding various features like large forests, major cities, and the mountain ranges. I have lots of books planned in this world, spanning centuries, so look for updates of that after I’m finished with the Witch’s Trilogy.